Plains Song Review Online: My bike's too hot to sit on; thanks, August! My bike's too hot to sit on; thanks, August! Pop Quiz! 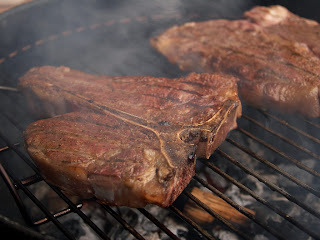 What do midwesterners currently have in common with this photo of two succulent porterhouse steaks? a) We're both from the midwest, duh! If you said A and C, you're correct! If you said B, you might want to rethink your current situation. The temperature (actual temperature, not heat index) finally reached 100 degrees yesterday, begging the question, "Why'd you wimp out on us, July?" Yes, I did expect to reach triple digits sooner than this, but now that we finally have, I'm already darned sick and tired of it. And that's just the real temperature--the heat index (the overexaggerating hypochondriac of the meteorological world) is set to reach approximately 42 billion right about the time I'll be biking my sweaty self home. Not only is it a nuicance just to be out-of-doors for more than 10.5 seconds, it's also particularly tough considering how much it costs to cool one's humble abode. So my question is this: on a scale of 1 to "Ay Carumba!" how warm are you? How is the weather in the rest of the plains states, and how are you coping?